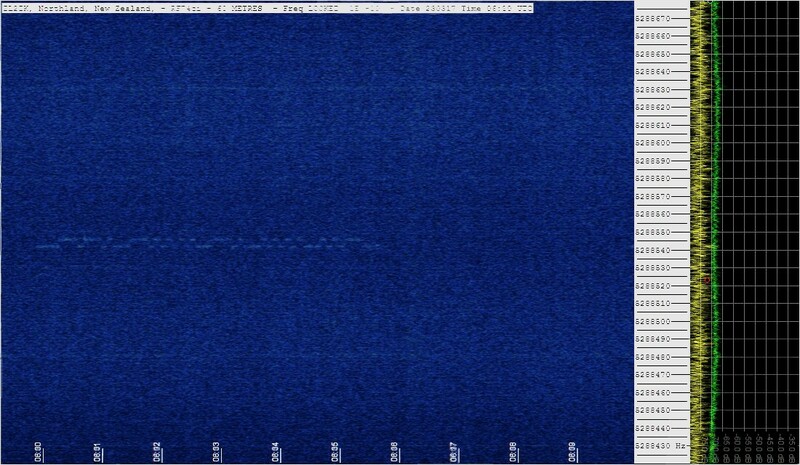 Toward the end of March I ran WSPR and QRSS on the 60m band for a couple of weeks. I did some experiments on 60m nearly three years ago which gave good results and I was keen to improve that. I posted on the new Knights QRSS list to announce that I would be active on 60m in the hope that some of the grabbers around the world would switch to 5MHz to listen for my signal and I was very pleased that a number of people happily switched over for a while. 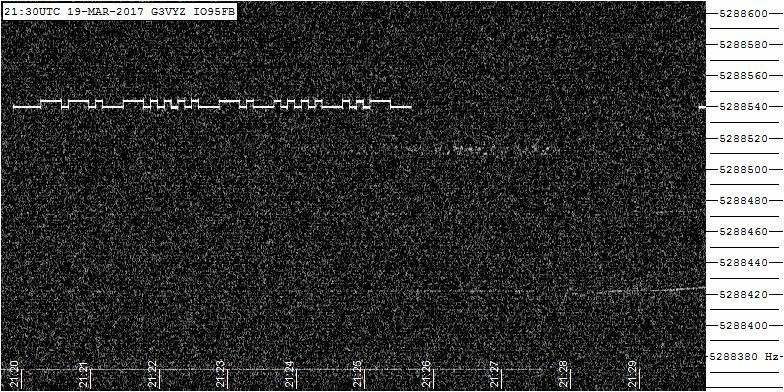 It’s an unusual band because there aren’t that many countries that have a 60m allocation and they don’t always match up around the world. Of course, anyone is free to receive on the band so that helps. I was very pleased to receive the following reports. All very good but no improvement over the tests we did before. There’s one more though. This is a stacked image and is still quite weak so let’s zoom in a bit. 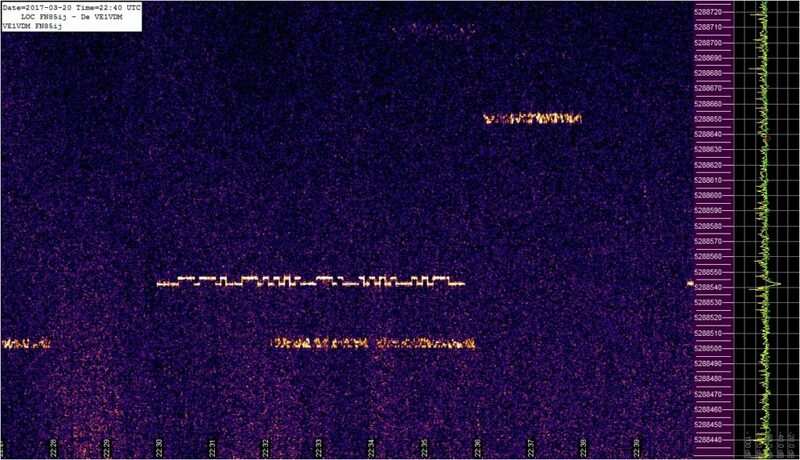 Here’s a capture from Pete’s eight hour grabber showing my received signal repeating itself around twelve times between 06:00z and 08:00z on 23rd March 2017. 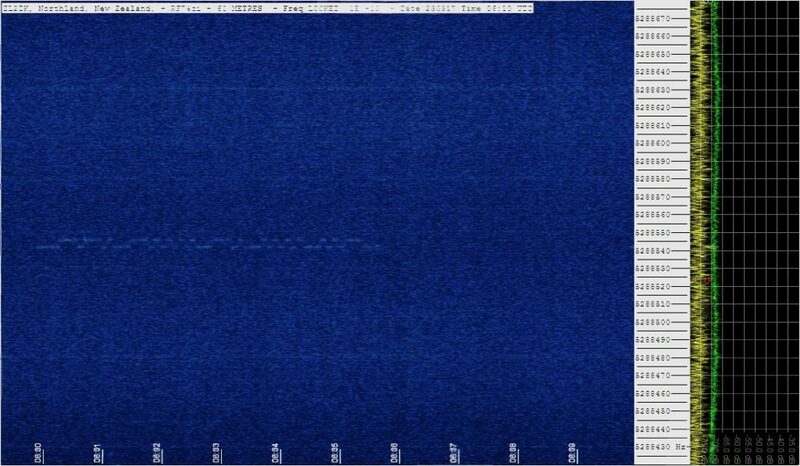 As far as I’m aware, this is the first time that QRSS signals have been successfully transmitted from G to ZL. I’m using my Hans Summers U3S transmitter with around 250mW output into a random length doublet, just 30ft AGL at the east end, sloping down to 20ft AGL at the west end. Pete, ZL2IK is using an Icom IC-R75 communications receiver locked to a GPSDO frequency standard (no drift) and a combined 80/40m dipole fed through an ATU to match it to 60m. 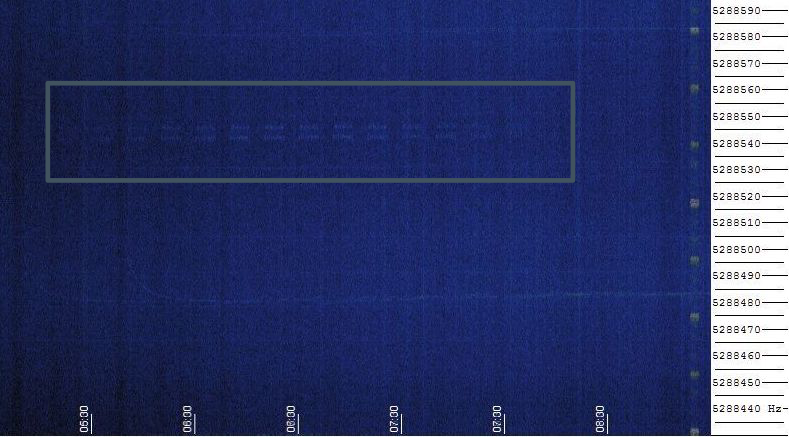 This entry was posted in Amateur radio, HF, QRSS and tagged 60m, Hans Summers, QRSS. Bookmark the permalink.